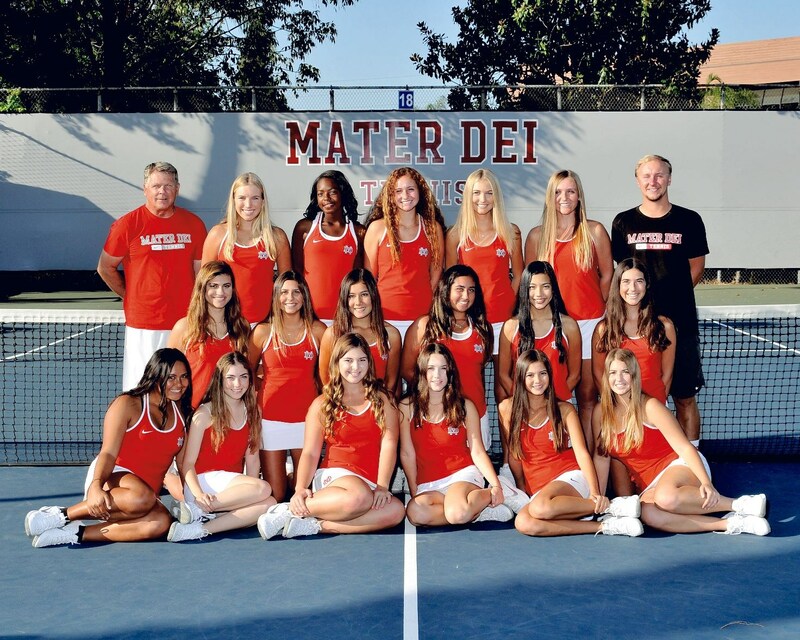 Mater Dei High School's Girls Tennis Team cultivates physical as well as mental strength in its student athletes. 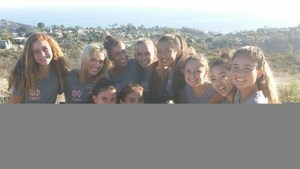 They strive for each player to grow to the height of their potential as an athlete and as a student. Head Coach Mike Moorewood has been an USPTA Tennis Professional for 15 years. Coach Mike has over 10 years of high school coaching experience. 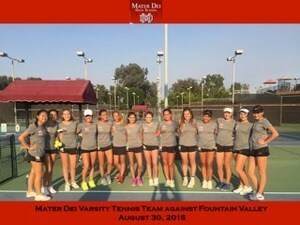 The Mater Dei Girls Tennis Program offers three teams: Varsity, Junior Varsity, and Frosh/Soph. 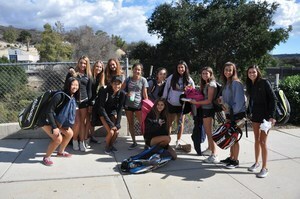 It’s easier to make a high school tennis team than you might think. Many of the top junior tennis players don’t try out for their school teams because it interferes with their ability to earn a USTA ranking, conflicts with their after-school academy training, and makes it more difficult to get a college scholarship. In addition to decreased competition making it easier for recreational players to earn a spot on a high school team, many schools have no-cut programs. Youth sports provide a host of benefits for teens, according to the President’s Council of Physical Fitness and Centers for Disease Control. Kids learn goal setting, discipline, sportsmanship, teamwork, dealing with stress and interacting with different personality types. Sports help kids perform better academically, develop leadership skills and help reduce your risk for a variety of diseases and conditions. According to organizations such as the Women’s Sports Foundation, girls who play competitive sports are less likely to drop out of school, abuse drugs and alcohol, have an unwanted pregnancy, perform poorly in academics, have low-self esteem and a poor body image, and get into abusive relationships. If you’re interested in playing high school tennis or want your child to have the experience of playing on a scholastic sports team, follow these steps to increase your/their chances of making a team. High school tennis is fun, but you’ll need to be able to play under pressure, especially when your team needs your match to clinch a win and everyone’s watching and cheering. Working with an experienced private coach or taking group lessons with friends from a coach you hire, you can learn how to avoid choking during big points. A good coach will set up pressure-filled practice sessions that recreate what happens during a match. You don’t need to be a great singles player to make a high school tennis team. High school teams need to win doubles matches to win conference and state titles. Many good singles players don’t know where to stand, serve, return or hit when they play doubles. Poaching and lobbing are also key doubles skills many good singles players don’t have. Work with a qualified coach to learn how to be a successful doubles player to improve your chances to make a high school tennis team. A qualified coach will be able to teach you the correct positioning, strategies and tactics to help you become a valuable doubles specialist for a high school (and college) tennis team. Many tennis players incorrectly work on their aerobic tennis conditioning to get ready for tennis tryouts, but that doesn’t help much during a tennis match. Tennis is an anaerobic sport that requires different conditioning than the type you get from jogging or using a cardio machine. Learning how to recover after a tennis point so you’re ready for the next point is as important as getting in shape to play points. Take some lessons from a trained coach who can show you footwork and conditioning drills that mirror what happens during a tennis match. Ask for high-intensity start-and-stop drills that make you run hard for 30 seconds, followed by 90 seconds of recovery. Want to prepare for your high school tennis season? Contact you coach about off-season training. Whether it be summer camp, an Academy, or private lessons as well as playing tournaments. your coach can help you find your game.